Standardization and increased specialization have slowly begun to separate the means and methods of making from the process of architecture. The introduction of digital tools towards the latter half of the century have functioned to further this divide, removing any remaining traces of materiality and scale. Accordingly, architectural design exploration primarily resides in the creation and modification of digital objects, which must then be translated into the physical world. This positions built architecture in a curious position of constant catch up, chasing the impossible ideal of its digital counterpart. However, the tools predominant in architectural design and fabrication today (CAD, CAM) may be appropriated, along with sensory feedback, towards the development of a new material workflow. 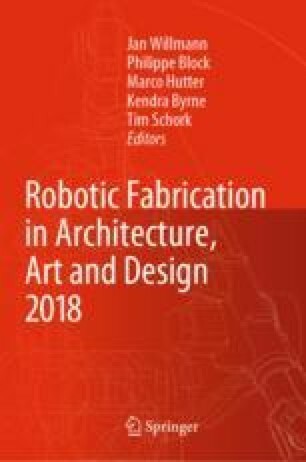 This paper presents a prototypical workflow which combines computational methods and robotic fabrication techniques with the spontaneity of the human and the messiness and contingency of material. The workflow is tested through the design of 1:1 heuristic architectural fragments. This research owes much to the faculty of Princeton University School of Architecture, specifically, Axel Kilian, Forrest Meggers, Ryan Luke Johns, Paul Lewis, Liz Diller, and Jaffer Kolb, and to the cohort of classmates in my thesis class for their equal support and skepticism.